Sometime around 1550, Thomas SONELAY was born at Nunnington, Yorkshire, England. Thomas married Janet LION on the 23rd October 1575 at Helmsley District, Yorkshire. Both Thomas and Janet died in June 1618. Thomas was buried on the 18th of June 1618 at Nunnington, Yorkshire. THOMAS SONLEY (b 1615) married Jane PETCH on the 30th July 1639 at Stonegrave, Helmsley, North Yorkshire. (i.e he inherited the family farm) on Thomas's death. Thomas died on the 26th January 1719 and was buried at Stonegrave Minster. Elizabeth senior died on the 16th May 1738 and was also buried at Stonegrave Minster. John SONLEY died 28 Sep 1747 at West Ness and his name was recorded as Sunley. In his own will of 1747 (Yeoman of West Ness) he signed his name Sonley. 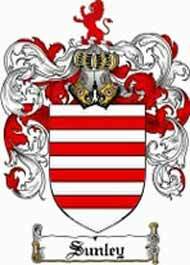 Only his wife and son Thomas were mentioned in the will, which probably means that he only had the one child.